A primary school headteacher has condemned vandals who broke into his school and daubed offensive language and images on the playground. An investigation has been launched into the wrecking spree at the Beaupre Community School in Outwell, which happened between 6pm on Thursday and 6am on Friday. Police say the offenders broke into a shed on the Church Drove site and took poster paint from inside. They then threw the paint over the school building, windows and roof, as well as plants and play equipment. They also used some to paint offensive language and pictures on the playground. The damage has been repaired before the school closes for the Christmas holidays later today. But the incident did force the Beaupre Under Fives, whose headquarters is in the school grounds, to close on Friday. School headteacher Owen Rhodes said the school had been “inundated” with offers of help following the damage and particularly thanked the village’s fire crews, school governors and Under Fives staff for their support. But he has also urged anyone who knows who might be responsible for what he described as a “senseless” act to come forward. He said: “Children should not have to attend the security of their school and be faced with this sort of damage and obscenities. This has shocked the community and I am confident the perpetrators will be identified. 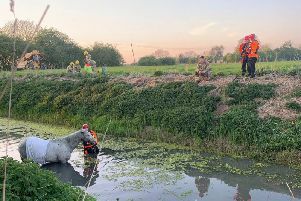 Anyone who has information about the incident is asked to contact PC Tamsin Raines, at the Downham Market police station, via the non-emergency 101 number.